The tunes of Judas Priest wafted from the 0.9-meter Telescope dome at McDonald Observatory while Gerald Handler observed pulsating stars. That's what he likes most about observing; he says he can "turn up the music really loud and just party away all night." On this night, however, David Lambert was walking on the catwalk outside the dome of the nearby 2.7-meter Smith Telescope and heard this famous metal band rocking away. He called Gerald and threatened to "shine a torch (flashlight) into his telescope." Gerald, of course, complied and turned the volume down, but, fortunately, his enthusiasm for music is almost as infectious as his excitement about exploring the stars that he observes. "Jupiter, Lord of the Sky"
Gerald was born in MÃ¶dling, Austria, a small town just south of Vienna. His father owned a "petrol station" and had hopes that Gerald would eventually take over the family business. Gerald had his doubts, but he enrolled in automobile engineering as a high school student to follow his father's wishes. "I was always interested in astronomy," says Gerald, but his devotion to the study of astronomy waned until his last two years of high school. One night, while waiting for the bus, he noticed a bright object in the sky. Thinking it was possibly the star Sirius, he dug out all his old astronomy textbooks and ruled out Sirius as a possibility. He just couldn't figure out what this object was, so he spent weeks poring over astronomy charts and books. Finally, he realized that the object was moving in the sky and concluded it was none other than the "lord of the sky," Jupiter. "He won't be of any harm." Because he read about nothing but astronomy, Gerald almost failed his final year in his studies of automotive engineering. Fortunately, one teacher realized his aspirations and went to the head of exam commission and pleaded for Gerald to graduate. In defense of his inadequate skills as an auto mechanic, he said, "He won't be of any harm because he's going to be an astronomer anyway." Gerald laughs as he recollects this because, while he is excellent with numbers and studying the heavens, the cars of Austria would have been in dire straits had he become a mechanic. "Peel a whole bag of onions without crying." Gerald did graduate from high school and then studied astronomy at The University of Vienna. He received his undergraduate degree there and stayed on for his doctoral work. During his graduate career, he made a couple of detours. First, he enrolled in his mandatory civil service for Austria for which he worked in the kitchen of a refugee camp. "I learned how to chop potatoes and peel a whole bag of onions without crying." Gerald, also visited, for a couple of years, at The University of Texas at Austin where he became famous for enduring long months of observations on the 0.9-meter Telescope, over 200 nights in all. "She was down there to fetch me." 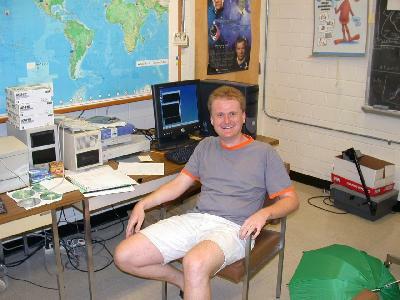 Ph.D. fresh in hand, Gerald traveled to South Africa where he worked at the South African Astronomical Observatory as a postdoctoral researcher. He enjoyed the work there but pined somewhat to be back at home. In fact, his Austrian girlfriend moved to South Africa to be with Gerald; "basically, she was down there to fetch me," he says. A year later, they did return to Europe.